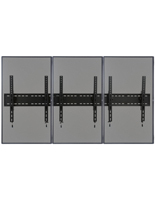 This tilting 3-TV wall mount has arms that are all VESA compatible, and can hold flat panels that are a combined weight of 264 lbs. Our bracket systems are often found in bars/restaurants, conference rooms, stores, universities, and homes for residential use displaying electronic signage or videos. 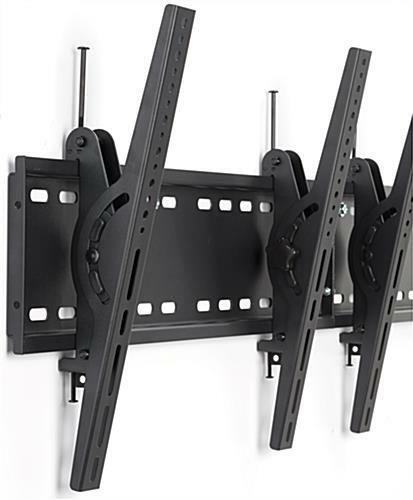 Crafted from durable steel, each 3-TV wall mount has arms with knobs to easily adjust the degree of tilt without the use of any extra tools. These brackets can move freely 10° - 15° to create the best angle to view the flat panel monitors. Our wall mounts come with the necessary hardware to hang electronics with ease. Whether you’re using this VESA unit in a home or a commercial business or store, we know that you’ll be pleased with the secure display!